Final presidential election results in the Republic of Congo began coming in Wednesday night, three days after the March 20 voting that was marred by a government-imposed blackout of television, phone, and internet communications, a measure that the administration of President Denis Sassou Nguesso said was necessary to prevent dissemination of what it called “illegal” voting results. But opposition leaders and press organizations protested that the blackout was nothing but a cover for election fraud that would return Sassou Nguesso — a 72-year-old former army officer who has ruled the equatorial African country of 4.6 million since 1979, except for a five-year period out of office from 1992 to 1997 — to the presidency for a third seven-year term. Sassou Nguesso claimed victory on Tuesday, saying that he had won 67 percent of the vote with 72 of 111 voting districts reporting, dominating his eight opponents on the ballot and avoiding a runoff election. But a coalition of five opposition candidates posted its own election results Tuesday, revealing its own numbers that showed Sassou Nguesso finishing no higher than fourth in any significant voting district. “It is impossible that the candidate-president could claim a victory, even taking into account only the partial results,” said coalition leader Charles Zacharie Bowao. But the opposition coalition did not post specific vote totals, nor did it name the candidates who finished ahead of Sassou Nguesso. For an overview of the Congo election results and tensions, see the video news report from Africa News, below. The government-imposed communications ban that went into effect on Saturday was supposed to be lifted after 48 hours, the government said. But by Tuesday, communications services, including cell phone and text messaging capabilities, were still out, reporters for the French Press Agency AFP reported from Brazzaville, the country’s capital city. Tensions have run high in Congo since last October, when a constitutional convention rewrote the country’s charter documents, abolishing a two-term limit on holding the office of president, as well as an age limit on the Congo president. Once those rules were erased, Sassou Nguesso was free to run for a third term. In 1992, Sassou Nguesso lost an election, amid allegations of systemic voting fraud, to former Prime Minister Pascal Lissouba. The contested election brought Congo to the brink of civil war and sent Sassou Nguesso into exile in Paris. After Lissouba imposed a series of repressive measures to quell dissent, Sassou Nguesso returned to Congo in 1997 and led a brief but bloody civil war that ultimately deposed Lissouba and put Sassou Nguesso back into the presidency. Elections were resumed in 2002. 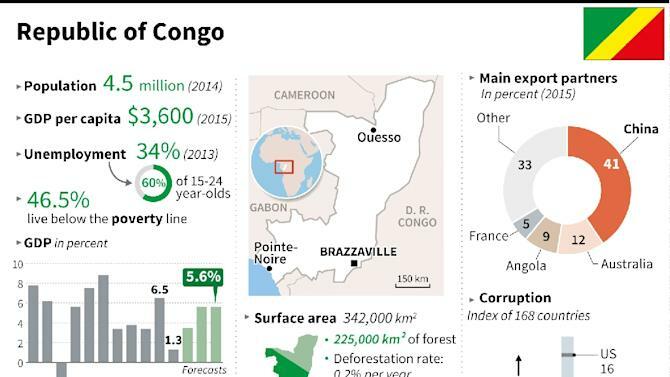 Though Congo is an oil-producing nation that is also rich in timber, suspicions of corruption in those industries have long plagued the country, and the Sassou Nguesso government and most of the country remains in poverty, with an unemployment rate as high as 34 percent, and 60 percent for young people ages 15 to 24. The explosive atmosphere leading up to the 2016 election on Sunday, and the government’s communications shutdown, has caused worldwide concern and fears that the violence of the 1990s could return. Both the United States and European Union governments put out a call for calm on the streets of Congo, and also called for communication services to be switched back on. “We ask all political leaders to renounce violence, call upon their supporters to remain calm, and seek to resolve any differences peacefully in accordance with existing laws and procedures,” said United States State Department Spokesperson John Kirby in statement on Tuesday. Congo television was in the process of announcing what it said were “official” election results late on Wednesday night, but opposition leaders appeared unlikely to accept the numbers.